Zoho Mail is the email platform for businesses. “Designed with business users in mind,” Mail has dropped all the ads so you can keep your privacy and focus on your mail (and getting things done found inside mail). It’s easy to organize and categorize messages to get to exactly what you want and need to get your work done. Maybe best of all, Mail brings the best of desktop mail together with the accessibility of browser-based email, so you and your team enjoy the features most important in today’s business environment. Mail is accessible almost anywhere, as long as there’s an internet connection. Access mail and docs from a desktop, laptop, tablet, or phone. Even though the application is web-based, Mail comes with all of the features of a traditional desktop-based email platform. Perhaps the most practical feature is the organizational tools. This includes multi-level folders that allow for a more detailed organization than most other email platforms, rules and filters for automated organization, and a conversation view for related threads. Besides the traditional desktop email features, Zoho has added some new ones too. When composing an email, just @mention a contact and the To field will populate with your recipient’s name. If you need a second opinion on an email, share a draft with a trusted colleague before hitting that send button. And, you can always keep your inbox clear. Batch archive emails by setting customizable parameters. Mail’s shining integration is with Zoho Docs. The integration means it’s easy to collaborate on documents, presentations, and spreadsheets. Team members can access the documents from Mail, and it’s easy to share with others from Docs. Integrate with Zoho CRM to keep track of all sales and marketing activity. The integration is so seamless, it’s like having a CRM right inside your inbox. Change can feel scary, but Zoho has thought of everything. Their migration tool makes switching to a new email platform quick and painless. 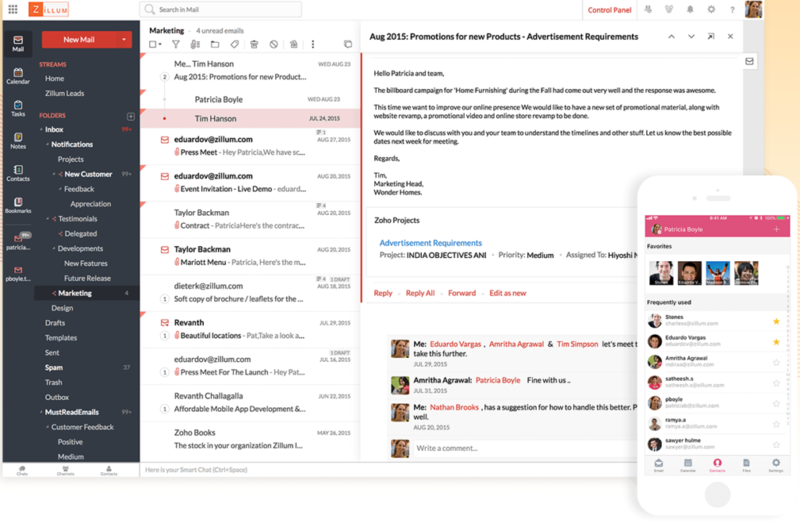 If you want a new way to work inside the inbox, Zoho’s email platform is a great choice for teams, especially for those working on the go.